For a few months now I've been thinking about writing an article about why I decided to rent an office in Second Life and how my virtual office there has changed the way I work and the kind of business I do. I booted up the MAC this morning to get started and saw this article from Web Worker Daily. Well I guess this will save me some of the bother. 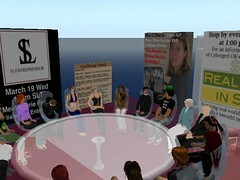 This is a really interesting article from Aliza Sherman about her usual business day in Second Life. Well worth a read. If at the end of it you are still interested in what i do in my office, here's a quick video slide show created with PhotoStory 3. Hope you enjoy this and get some food for though from it. Nice minimalistic office! 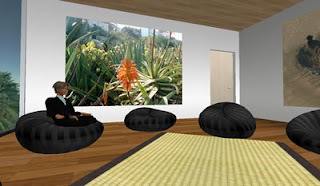 I'm a big fan of bean bag chairs and tatami mats in SL. Thanks for linking to my Day in the Life piece on WebWorkerDaily.com. My pleasure. It gave me a few more ideas on how to work from home and not starve. I'll probably still write something (eventually) on how I use my office too, but I really enjoyed reading about your day.